Well, it is January, so it is the time of year where we all (well many of us – even if we don’t admit it) make some resolutions and it is the time when blogs and news articles are full of hints and tips on how to achieve those resolutions. 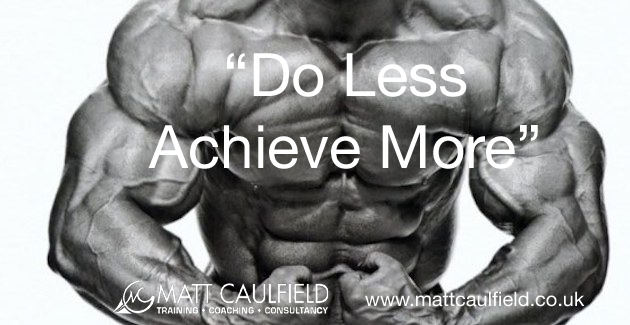 I realised that doing more doesn’t guarantee more, or better, results. This idea has become a guiding principle of mine, whether that is making personal changes or working with clients. I have written how NLP is not about grand operatic interventions here before, and how finding the “minimum effective dose” is much more powerful. And no more is it important than when we are wanting to makes changes in our lives. We tend to try and do massive shifts all at once, trying to do too much at the same time. This tends to be counter productive; it overwhelms us and wears us out. Tiny changes, extrapolated over time, make massive differences. It is consistency that is the key, not how much you do all in one go. Spending 10-15 minutes a day, every day, on learning a new skill will create much larger gains than an hour on it once a week (or when you remember!). It is easier to find the time and easier to motivate yourself. So, with any change you want to make, experiment on what the minimum is you need to do to get there.